DISCONTINUED. Designed with the space-pressed home in mind the Baxi Neta-tec Combi 33 GA boiler has a 89% SEDBUK 2009 efficiency rating meaning it is a highly efficient boiler. Recommended by the Energy Saving Trust it's an ideal choice for smaller homes that have a high hot water demand. Combi boilers are a popular choice because there's no need for a separate cylinder to store hot water; hot water is produced on demand. 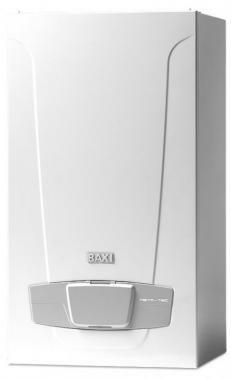 The Baxi Neta-tec Combi 33 GA will automatically set itself to run on LPG or natural gas. With its user-friendly controls this easy to use boiler also benefits from a handy service due indicator. Another added advantage of this boiler is its size. At just 70x39x29cm this compact little boiler will sit happily inside most standard kitchen cabinets. The Neta-tec combi is recommended by the Energy Saving Trust.